We’ll look at Encounter at Farpoint on the anniversary of its first broadcast; so Mike Poteet kicks off this year’s Trektember with Season 1, Episode 6: Where No One Has Gone Before. A visiting engineer’s unorthodox warp drive experiments send the Enterprise hundreds of thousands of light-years across the galaxy and into another dimension where thoughts can reshape reality. Wesley realizes the mysterious alien known as the Traveler, who came aboard as the engineer’s “assistant,” is actually the reason the experiments worked at all. The Traveler is the ship’s only hope of returning home, but is dying. He manages to return the Enterprise to where it should be when the entire crew focus their thoughts on his well-being. He then vanishes, but his influence will continue to loom large; because the Traveler identified Wesley as a prodigy in the intricacies of time and space, Picard grants “the boy” the rank of Acting Ensign to encourage him to pursue a Starfleet career. Inspired by Diane Duane’s popular 1983 Star Trek novel The Wounded Sky, this episode was arguably TNG’s first “high concept” episode since the pilot. Drawing on concepts from quantum physics which were only still gaining popular awareness in the late 1980s, and featuring some genuinely impressive visual effects, the episode musters a “sense of wonder” that the series’ first season rarely achieved. And the two main guest stars—the late Stanley Kamel (later of USA Network’s Monk) as posturing, puffed-up engineer Kosinski, and Eric Menyuk (who’d been a contender to play Data) as the mystic Traveler—deliver lively, nuanced performances. 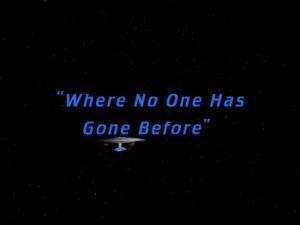 Capped by Wesley’s realization of every Star Trek fan’s dream (which may account for why so many fans disliked the character for so long), “Where No One Has Gone Before” is in every respect an episode worthy to bear the franchise’s famous motto as its title. The strange starscapes the Enterprise enters during this episode were created by digital artists, but they resemble the breathtaking real-life space images captured by earthbound and orbital telescopes. They remind viewers of faith that “the heavens are telling the glory of God…” (Psalm 19:1, NRSV). The beauty that exists in the cosmos is wonderful in and of itself, but it is even more wonderful to those who see in it the beauty and order that God wove into reality in the beginning. But we are meant to do more than gaze approvingly at the world. We are meant to engage it (no Trek pun intended), to learn about it and care for it—to tend God’s garden (Genesis 2:15), even beyond terrestrial boundaries. 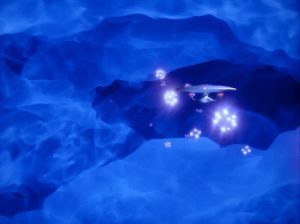 After the Enterprise‘s first leap into the unknown, Data recommends the ship continue to pursue its mission despite the unusual circumstances. “Why not avail ourselves of this opportunity for study?” he asks. “There is a giant protostar here in the process of forming. No other vessel has been out this far.” Picard says Data is speaking “like a true Starfleet graduate,” but he’s also speaking like one who is ready to “learn all that is learnable” (to repurpose a phrase from Star Trek: The Motion Picture). And if, after investigating “the heavens, the work of [God’s] fingers” (Psalm 8:3, NRSV), Data felt moved to worship, he’d be speaking like a person of faith. The Traveler tells Picard that the captain must encourage young Wesley Crusher, because “the boy” is full of potential: He is gifted with the “lovely intricacies of time, energy, propulsion…” While it was fashionable during TNG‘s run to mock or scorn Wesley—the “kid who saves the ship,” Star Trek’s very own Will Robinson—I rarely did, and certainly not around this episode. Picard and Riker were too busy telling Wesley to be quiet, to wait, to stay out of the way. The Traveler was the only adult affirming Wesley’s strengths and talents. The Traveler does what a community is supposed to do, especially a community of faith: Helping its members identify and develop the gifts given to them by the Spirit for the common good (1 Corinthians 12:4-7). It’s not enough for us to think we’re good at certain things, or feel drawn to activities we enjoy. We need the input of the community—the “external call,” as Reformed Christians often say when discussing the call to ordained ministry. God gives us each other, in part, so we can help each other grow into the people whom God means us to be. Does the community always discern its members’ gifts and callings accurately? No. Viewers who know Wesley’s complete arc know (nearly 30-year-old spoiler alert) that Starfleet does not turn out to be his true vocation. 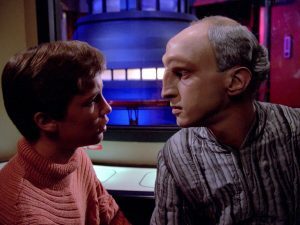 And note, even in this episode, the Traveler does not tell Picard, “Make Wesley Crusher a bridge officer.” Picard’s interpretation of how he should encourage Wesley is conditioned by his own experience as a satisfied Starfleet officer (and, as Diane Carey suggested in the first original TNG novel, Ghost Ship, perhaps his own guilt over Jack Crusher’s death). But God places us in community so that we stand a better chance of hearing our calls more clearly than we would in isolation. And together, through His gifts of Cosmos and Calling, we can enjoy and marvel at His creation all the more. Thank you for reading Redeeming Culture! Mike Poteet brings us more Trektember tomorrow, as he reviews another Season 1 gem, Skin of Evil. So be sure to come back for the next episode! Mike Poteet is a freelance writer and an ordained Minister of the Word and Sacrament in the Presbyterian Church (U.S.A.), serving the larger church as an author of Christian education resources. He’s also been a hopeless Trekkie since 1985, and is thrilled to have a professionally published Star Trek short story to his credit (in Star Trek: Strange New Worlds II, ed. Dean Wesley Smith, Pocket Books, 1999). Mike writes about pop culture collectibles for Entertainment Earth, and has contributed pieces on the intersection of faith and pop culture to The Sci-Fi Christian. Follow him on Twitter at @WriterMPoteet. This is a nice piece for the series’ first qualifier for a great episode. Taking a page from 2001: A Space Odyssey, the effects were clearly crafted to amaze, not just communicating the grandeur of the universe, but working as acts of deliberate art. I resonate with your read on “the boy” too. It’s odd to shun someone whose primary annoyance is inserting himself into conversations because he has been given no other avenue to communicate his observations. Your assessment of Wesley’s arc reminded me of Proverbs 22:6, “Train up a child in the way he should go; even when he is old he will not depart from it.” The emphasis is often placed on the ‘should’, which can imply too much external molding: “I want my son to love football, so I’ll raise him to love football, and scripture tells me that he will.” I’ve always read the emphasis on ‘he’, putting the importance on the child’s design, who God has made him or her to be. I find football to be dull, but if I had a kid who loved the game, I would raise her to understand it, enjoy it and pursue it to the degree that it would seem to be a way she should go. I don’t see Picard as manhandling Wesley, mind you. He’s doing Proverbs 22:6 the only way he knows, open the ship up to “the boy” a little more. He *can’t* help Wesley become a Time Lord, but when Wesley realizes his true future, his mother is the one who reminds him about the Traveler, finishing off the Proverb well. I like your reading of the proverb. I think our strengths and talents are very often indicators of God’s design for our lives. And perhaps I was too hard on Picard, especially considering that God may not have one single purpose for our lives — excepting, of course, the non-negotiable vocation of loving and serving God, loving and serving our neighbor. We can fulfill that purpose, we can stay on that God-given path, in more than one way. Had Wesley not ended up a Time Lord, but had gone on to a long and satisfying career in Starfleet, he still would have been using his gifts for others benefit and his own personal growth — and, even if he never acknowledged it (this being Star Trek, after all), for God’s glory. But I’d hate to think God has The One And Only Career (or School, or Spouse, or Job, or Anything Else) picked out for us, and woe to us if we don’t read the clues correctly and choose the wrong one! Very much agreed on the One And Only issue. It’s not on us to figure it out His specific plans. *If* He has someone specific in mind for me to marry, then that’s who I’m going to marry, whether I do and discover the right things or I don’t (the latter being more likely). He can work it out without my assistance. Also, if His hand leans on the heavy side regarding plans for our lives, he also knows our times. We may change jobs, or lose spouses, and He’s aware of that. If He arranges it all, then he arranges a career, not a job, and a relational life, not just a relationship.